Everyday you see someone with something made out of 550 paracord. Keychains, rifle sling, handles you name it, it can be made out of paracord. 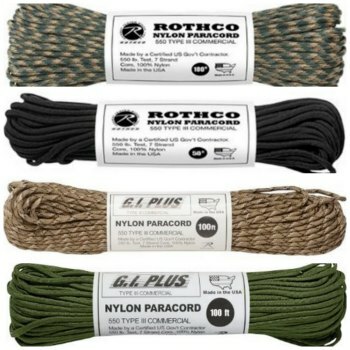 Here are some great deals on paracord in both 50 foot or 100 foot lengths. It comes in 26 different colors. Having a good survival knife is one of the first things you should consider when heading outdoors. Sure you can use it to entertain yourself around the campfire. But you can use it to actually survive by using a short log or stick to help cut through large branches for everything from tent poles, to firewood to even sticks you want to carve into wooden spoons and even fall traps. 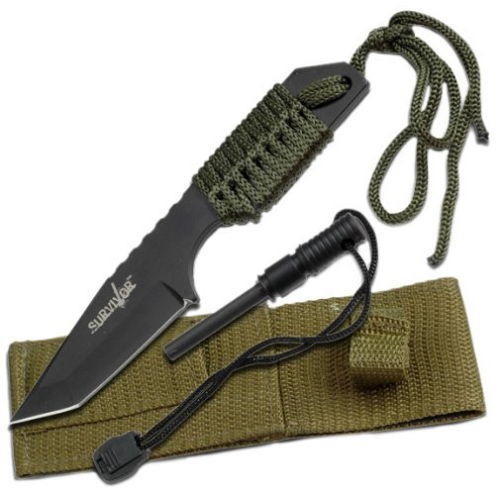 With out going all Rambo with the handles that contain everything you would ever need, a simple survival knife with extra paracord and even a flint fire starter helps get everything you need to survive right with you, without all of the hidden compartments. This survival knife that is a full tang with attached paracord on the handle and the flint rod in the sheath is about as simple as you can get it! And one of the best things is that it will save you money as well. Which really leaves you with more cash to spend on your survival checklist or even on your next gun purchase. As low as $5.99 for the small 7 inch overall length version and $14.99 for the 11 inch over length version each come with free shipping options.